I’m starting a GitHub project called OpenBlueprint that will gather functions, macros and entire Blueprints in one place and make them available to anyone. Anyone can grab it and use anything that is in there in their projects. So far, it only includes one modest function inside a function library, but I’ll add some more stuff later today. I need your help adding new content to it, so if you have any cool macros or functions in your library, or some blueprints that you think will be useful to other people, please share! Hello people! Remember me and my Ludum Dare 27 game? Of course you don’t! But that’s okay, I didn’t expect you to. In fact, go away, I’m writing this post for myself, as an affirmation of sorts. What? You’re still here? Shoo! Now, on a slightly more serious note, I am, in fact, working on a post-compo version of my latest Ludum Dare entry, Stator Chronicle, as I consider it to be a rather successful experiment indeed. Naturally, it has flaws, and the feedback that you guys have left is invaluable to me, so I will be grateful if you leave even more, as every new comment either gives me more motivation to continue working on the project or helps me improve the future full game (sometimes both, believe it or not). This is the first post-compo improvement to the game, wind zones now work as intended, and their “glitchiness” is completely eliminated. Just something I didn’t have time to fix during the 48 hours of the compo. Like I said, I’m just trying to be assertive here (and my own blog appears to be broken for some php-related reason), so I needed to write this post to make it official: Stator Chronicle is going post-compo. Be excited. Or not. I know I will be! The game is both gameplay- and story-driven. Eat Rotors to get highscore and add seconds to your Frostbite timer, on a larger scale collect Rotors and unlock new pieces of background story with them. The world is completely procedural, and there are two complete stories in the system (the second one starts where the first one ends). The second story tells you more about Rotors, Stators and wizardry, so keep your eyes open and farm those Rotors! Thanks to everyone for making and rating games, you’re cool. Stay cool! Hi guys. I’m going to be using my class that I wrote earlier for user interface during this Ludum Dare, so I’m sharing it here for those who want a quick solution for fully responsive GUI with Unity without using any external plugins and stuff. 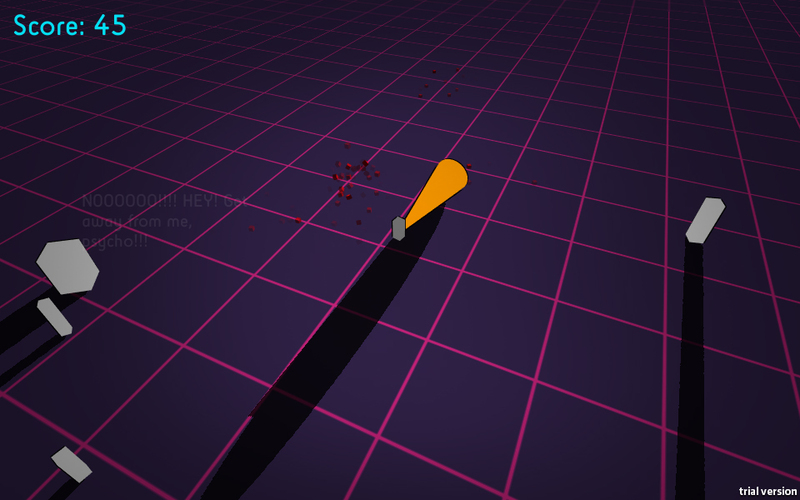 The original post is here: http://blog.sergeymohov.com/fully-responsive-user-interface-with-unity-gui/. You’ll find the API there. Get the GUISizer class here: http://goo.gl/wgdFX6. You can also download an example project here: http://goo.gl/5F5PIY. Or, if you prefer, the same thing as a UnityPackage that you can import into your own project: http://goo.gl/GKczDm. The source code is also added to the bottom of this post in case the links die. If you use C#, then feel free to put GUISizer.cs anywhere you want in your project. However, if UnityScript is your cup of tea, then it has to go into your Plugins folder. Otherwise you won’t be able to access its methods and structures. Do not spend 30 hours making graphics assets and music. Do not make a game that relies heavily on animation, animation is the worst time-consumer. Do not use tools that you are not familiar with (in my case—RagePixel for Unity, an awesome but buggy tool that I decided to try for Ludum Dare). Do not spend hours making levels: level design is something that always takes more time than you expect. Now, to give you an idea of what came out of this, go check out my 30-second game with lots of stuff packed into those 30 seconds, but 30 seconds nevertheless. It’s called Dissolution (screenshot is a link to Kongregate). Now, I have learned my lessons. For my second consecutive Ludum Dare I sure as hell wasn’t going to repeat the same mistakes. Here’s my short list of conclusions regarding what you should do for a 48 hour solo game project if you want to actually complete it and maybe squeeze a few hours of sleep somewhere halfway through. Do make all things procedural. You’ve got enemies? Great, make them spawn procedurally and randomize their types. Got platforms? Generate short sequences and randomize them. Making a labyrinth game? Awesome, there’re dozens of maze generation algorithms on the web. Do make stylish graphics. Your Ludum Dare game can look good even without those shiny sprite sheets and complex 3D models. Keep your artwork as simple as possible and compensate by having nice-looking visual effects. Do make sounds and music. This is essential for correct perception of your awesome art style. What worked great for me so far is stylized graphics + more or less realistic sounds. Do design a simple game for each of the 12 themes in the final round of voting. It is a good exercise in game design, and it will help you get straight to coding once the theme is announced. Ideas are cheap, what counts is implementation. As far as assets are concerned, you have to find a balance between sound and graphics, because you can’t make both very sophisticated, you have to prioritize. If you do all of the things suggested, you will find yourself being able to sleep a whole night and spend up to 12 hours polishing and optimizing your game, which, in turn, means that you will end up with something that feels infinitely better than most Ludum Dare games. All those things out of the way, I give you Pineapple Dreams, my Ludum Dare 25 game about being a villain. The game features ultra-violence and was inspired by A Clockwork Orage, Drive and (you guessed it) Hotline Miami. Screenshot is clickable and leads to the game’s Kongregate page. I have participated in Ludum Dare 24 with my game, Dissolution. Many of you said that you wanted more of it, so I’m beginning to work on more. An awesome writer is working with me to bring more depth into this project. Together we will explore the subject of life and death and, well, dissolution, as deeply as anyone has ever explored in a game. But in order for this epic project to succeed, we need your support. I’m sure that you will buy Bundle-In-A-Box (http://bundle-in-a-box.com/) anyway, so when you come to redeem your games, please vote for Dissolution if this is something you think you would like to play as a full game in future. The more votes we can get—the closer we will be to receiving a grant, it’s really that simple. Aaaaaaaaand IT’S DONE!!! I haven’t slept or eaten in two days, and now I’ve finished this LD entry! You all can go play in on Kongregate, Mac and Windows: http://www.ludumdare.com/compo/ludum-dare-24/?action=preview&uid=9963 This was the most epic crunch of my life, and totally worth it. I’m going to add more content to the game for LD Jam and then probably go on to finish the game. I’m really hoping for your feedback and all that. The game is called Dissolution. It doesn’t have a genre and combines various elements of platformer, adventure, RPG and puzzle. The protagonist (his name is the Dude) is an amorphous creature with mentality of Max Payne who once wakes up in a cheerful and colorful world and can’t stand it the least bit. Dude tries to find his way out and fights various obnoxious unicorns and fairies while trying not to be consumed by this inhospitable environment. The world is constantly in motion, as black-and-white (part of which is the protagonist) does its best to consolidate its efforts and gather up enough resources to defeat the vicious creatures of light. 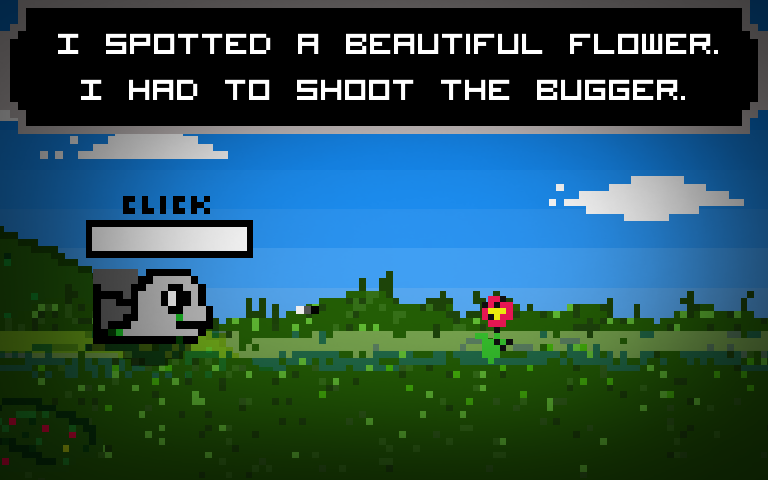 As Dude moves across the terrain, he slowly submerges in the flowers and grasses, so the player’s task is to find sources of black and gray and munch them to develop some kind of resistance and eventually evolve into something bigger and stronger. A few more screenshots from Dissolution. Just implemented the first enemy. More to come, also working on some sounds right now. This is the first time I’m doing a post here, so forgive me if I happen to be unconventional or inappropriate (I’m often inappropriate). The game that I’m making for this Ludum Dare is called Dissolution. It’s my first humblest attempt at pixel art. The game doesn’t have a genre and combines various elements of platformer, adventure, RPG and puzzle. The protagonist (his name is the Dude) is an amorphous creature with mentality of Max Payne who once wakes up in a cheerful and colorful world and can’t stand it the least bit. Dude tries to find his way out and fights various obnoxious unicorns and fairies while trying not to be consumed by this inhospitable environment. I’m afraid the project is too ambitious for 48 hours, but I’ll do my best to squeeze in as much content as possible. Certainly not going to sleep for the next 24 hours. I hope you will enjoy Dissolution. Cheers.